“Enough Rope for Two”, an episode on the Alfred Hitchcock Presents television anthology series (Season 3, Episode 7), is another tale of unscrupulous people consumed by greed. Scripted by Joel Murcott and based on Clark Howard’s story, the episode was directed by well-known actor-director Paul Henreid. 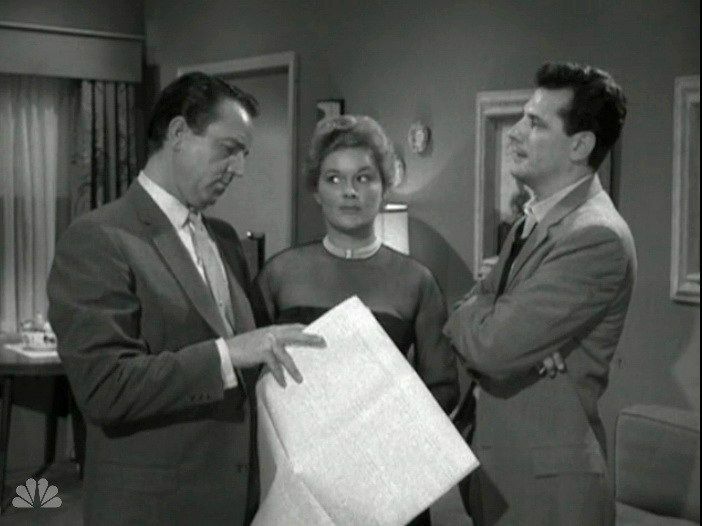 In many ways it is similar to the subsequent episode, “Water’s Edge” (1965) that appeared later on the The Alfred Hitchcock Hour (Season Three, Episode 3). Both tales concern someone getting out of prison and seeking to recover lost stolen loot that the police had never found. But both episodes suffer from the same deficiency: all of the principal characters are so dishonest and reprehensible that the viewer is unlikely to have a vicarious engagement with any of them. Nevertheless, a feature of this episode is the number of double-crossings (DXs) that take place among those teaming up to steal the loot. The story begins with Joe Kedzie (played by Steven Hill) getting out of prison after serving a ten-year sentence for stealing $100,000. 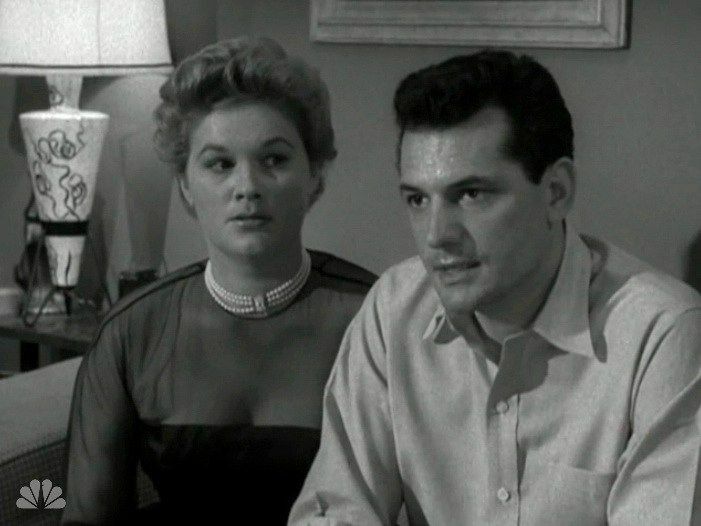 The backstory is revealed that Joe’s criminal partner, Maxie (Steve Brodie) had secretly conspired with Joe’s girlfriend Madge (Jean Hagen) to have Joe arrested for the crime so that they could have all the $!00,000 to themselves. We can call that double-crossing #1 (DX1). But Joe had been suspicious about his partners and had secretly stashed the loot out in the Mojave Desert before his arrest (double-crossing #2 – DX2). Now they all meet again in Madge’s apartment and feign camaraderie, but their mutual hostility is barely concealed. They go to a hardware supply store to buy the shovels, gear, and 50 feet of rope, that they will need to dig up the loot that Joe had hidden at the bottom of an abandoned mine shaft that is 100 miles out in the barren Mojave Desert. At the store Joe secretly buys a pistol and bullets that he apparently intends to use to kill Maxie (DX3). But Maxie happens to see this transaction in a mirror, and so he surreptitiously gives Madge a knife that he wants her to use to kill Joe (DX4). When they get to the abandoned mine shaft out in the searing desert, Joe reveals that he knows that Maxie and Madge had cheated on him. He quickly shoots Maxie dead (and accidentally in the process puts a bullet hole in their water canteen), and then he slaps Madge to the ground. Then Joe lowers himself down the narrow mine shaft using the rope tied at one end to the tow hitch of their rented jeep. At the bottom of the mine shaft, Joe digs up the parceled cash and has Madge lower a string so she can pull it up out of the shaft. Once Madge has the cash in her hands and with Joe now climbing up on the rope, she starts thinking she can keep all the loot for herself. So she cuts the rope with her knife, and Joe crashes down to the bottom (DX5). But when she gets into the jeep to make her getaway, she realizes that the key to the jeep is with Joe down in the mine shaft. So Madge calls down to Joe and tells him that the rope broke and now that the remaining rope is too short, she needs the key to the jeep in order to move the jeep closer to the shaft so that the rope will be long enough to reach Joe. She tells him to place the key on the string she will lower. Joe doesn’t trust her, but Madge says she will lower the cash parcel back down on the string to guarantee that she won’t run off with the money this time (DX6). Joe still doesn’t trust her, but if he doesn’t agree to Madge’s request, they will both die of thirst out in the desert wasteland. Will there be one more double-crossing? You will have to watch this episode to find out what happens in the end. Overall, this episode is well produced, with very effective acting on the part of the three principals. Although the performances are very emphatic, they go well with the overheated dramatics associated with all the double-crossings. The only drawback, as mentioned above, is that there are no characters with whom the viewer can sympathize in this tale. They are all just too malicious. Excellent. I love your work. Notice that allAll your favorites are from season three. Hulu has been playing the first four seasons of AHP. Wonder if they'll ever get the rest.